Take Advance Wars, replace tanks with Transformers, then release it on the iPhone. Sounds like a dream, but that's exactly what Glu Mobile has done with Transformers: G1 Awakening. In what is actually an iPhone port of a mobile game from a year or two back, Awakening is a turn-based strategy game that puts you in command of the Autobot forces, as they wage their battle…to destroy…the evil forces oooooooof…the Decepticons. Question is, will it light your iPhone's darkest hour? Or is it really over, Prime? Fan Service – Anyone who holds the original Transformers as the pinnacle of the franchise is in for a treat here. The game looks and sounds like it fell right out of 1985, with the transforming sound, original character designs, even the bios you used to find on the back of the toy boxes. Best of all? The battle animations, which render the opposing characters in full 3D, and for an iPhone game, look great. Autobot Strategist – This insistence on being a true Transformers experience carries over into the game design, and actually works in the title's favour. You're only ever in control of a handful of units at any given time, and each unit is normally a specialist, so it really pushes your tactical thinking. Ratchet is the game's only medic, for example, so you need to think carefully where you're going to send him, as you can't just build another one to complement him. And if you do need to call in reinforcements to swell your ranks a little? Well, Autobot city Metroplex is always on-hand to serve as a mobile base, able to call in reinforcements like Ironhide, Sideswipe, Prowl and Grimlock. It's A Mobile Game – Awakening is a port of a 2008 mobile phone game, and it shows. Glorious battle sequences aside, the game's presentation is poor, especially the animation of units on the main battle screen, where in robot mode the characters don't even move. They just shuffle around, legs immobile. For a license like this on a more powerful platform like the iPhone, it could have done with a little extra work. Transformers: G1 Awakening isn't just a surprisingly authentic piece of fan service for long-suffering fans of the original television series, it's a competent turn-based strategy game in its own right, easily one of the best on offer for the iPhone. As such, it's easy to recommend it to fans of either or, if you're lucky, both. 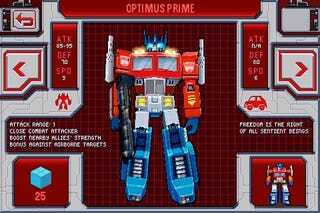 Transformers: G1 Awakening was developed and published by Glu Mobile for the iPhone. Released on February 25 on the App Store for $5. Completed Autobot campaign, played two games of "hot seat" multiplayer.